It usually starts immediately after Halloween. Once the paper ghosties and plastic ghoulies return to the dank darkness of their closet, basement or attic tombs until the following autumn, the Thanksgiving-Christmas/Hannukah-New Year Axis drops. Coincidentally, the amount of daylight and the temperatures drop too. The only thing that typically rises? Stress. Perhaps knowing that the possibility exists of plummeting into post-Halloween intense stress – and its compadres anxiety, depression and listlessness/fatigue – may be half the battle. But most of us are so busy juggling personal and professional obligations, appointments, deadlines, and the appearance of spontaneous problems that command immediate attention and action – that the notion isn’t enough to prevent it. There are factors that exacerbate low mood and stress intensity during the holiday time. Chiefly, unrealistic expectations of family and romantic togetherness, financial pressures and too many commitments (another corporate Secret Santa to shop for?) all coalesce to aggravate stress. We are also bombarded with ubiquitous and frenzied “buy now!” sales and marketing holiday hype that increases pressure to expand shopping lists (and creates visions of dollar bills flying out of one’s wallet). But wait, there’s more: holiday time is a period of over-indulgence in food, especially rich desserts and treats, as well as alcohol. Although at the moment the indulgences feel appealingly festive, the overeating and hangovers don’t help combat holiday stress. Last month, we covered SADs – and this is also a critical component of holiday stress. Symptoms of holiday stress include anxiety, insomnia, irritability, fatigue and headaches. Ensure your mindset is one of realistic expectations and goals. Realize your schedule and pace yourself – refrain from taking on more than you know you can handle. Create a list of what you need to do by priorities. Check off each one that is accomplished so you can see – and feel good about — your progress. 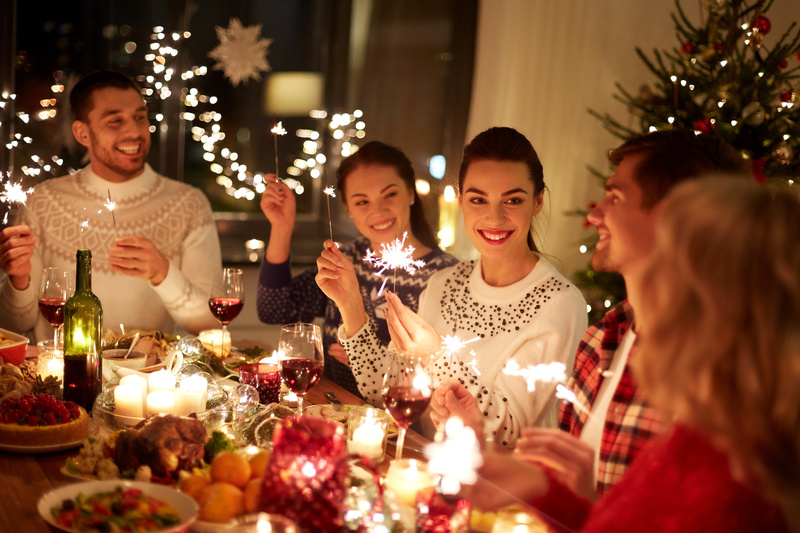 Don’t microfocus on the one holiday (Christmas, New Year’s), but enjoy the full seasonality and the days in between. If your life is harder this year, perhaps marked by loss, do not compare this holiday season with those in the past. Find something beautiful, special and unique to focus on this year. Ge involved in many of the “free” holiday activities like touring neighborhoods to enjoy creative, festive holiday decorations – or join a caroling group. Volunteer at church or synagogue or homeless shelters. Monitor gift-buying. Overspending and high bills post-season will undeniably cause stress to return. We also suggest a nutrient-rich diet high in antioxidants and omega 3 EFAs, known to help combat depression. In fact, a recent randomized, placebo-controlled double-blind clinical study showed that omega 3 EFAs improved depression symptoms as well as anxiety and sleep quality. A go-quality multivitamin complex provides the micronutrients your body needs to function optimally, especially when facing high stress. Other supplement tools include specific botanicals shown by research to support the body and mind during times of stress and are thus perfect for the holiday season. LJ100® Tongkat Ali (Eurycoma longifolia) has been shown to relieve stress and promote healthy mood in one study. The researchers analyzed assessed stress hormones and mood state in 63 subjects (32 men and 31 women) screened for moderate stress and supplemented with LJ100 or placebo for 4 weeks. The team found significant improvements in the LJ100 group for mental stress characteristics of tension (−11%), anger (−12%), and confusion (−15%). Additionally, the stress hormone profile (salivary cortisol and testosterone) was significantly improved by LJ100 supplementation, with reduced cortisol exposure (−16%) and increased testosterone status (+37%). And because so much holiday stress affects one’s mental state and energy, BlissCare™ (Mucuna pruriens 60%) is an herb that has been shown to promote healthy neurotransmission and cognition via supporting healthy dopamine levels. Dopamine helps modulate the brain’s reward and pleasure region. Quantum IQ™ kesum extract also benefits mental performance and mood, as well as relieves stress and tension. In one randomized, double-blind, placebo-controlled, crossover trial 20 healthy adults were given 150 mg of Quantum IQ™ or placebo. When compared to baseline, the Quantum IQ™ group demonstrated significant improvement in Cognitive Function Score in Reaction Time, Working Memory, and Sustained Attention. Supplementation of Quantum IQ™ also demonstrated a significant reduction in tension, depression, and anger in profile of mood states (POMS) survey. Another randomized, double-blind, placebo-controlled trial gave 35 healthy middle-aged women either 250 mg of Quantum IQ™ or placebo twice daily for 6 weeks. Quantum IQ™ showed significant improvement in those with mood disturbance. Among subjects with normal mood, Quantum IQ™ significantly improved short term memory. Further, the supplement group also experienced improvements in anger, total mood disturbance, tension, lack of energy/fatigue and social functioning. All of us at HP Ingredients wish you and yours a happy, healthy and festive holiday season!